Everyone wants to be independent and not look for help. However there comes a time when your health matters more than being independent. Clearing snow from driveways, steps and sidewalks in front of your home is one of those areas. We decided to put together this short post about, Help for Seniors clearing Snow. If you are going to do it yourself, at least take precautions and look after yourself. Lots of heart attacks occur because seniors work too hard clearing snow and avoid other physical activity. We put together a quick list of tips for seniors and really anyone who is not used to physical activity. There is a right way and a wrong way to clear snow from the snowblower chute. Many snow blower limb accidents occur every year because the operator sticks their hand down the chute to clear snow . This happens to experienced operators more than it should. There are two categories of accidents. First the operator does not turn the engine off. The auger and impeller is still turning in a two stage blower. A foot or hand is inserted to remove clogged snow and they lose toes or fingers or worse once they clear the snow away and they get caught. The second type of accident occurs even when the engine is turned off. The chute and auger area is clogged with wet snow. You turn off the engine and start clearing the wet snow away. Unfortunately because of the clogged snow rotational force was built up. When the snow is removed, the auger can move several inches. The impeller can also rotate several inches as well. If your fingers are in the way, your going to lose them! 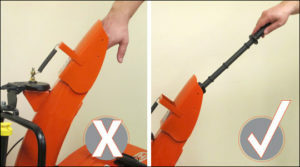 Never insert feet or hands anywhere near the impeller or the augers. Always use a stick or some other tool. Better the stick gets broken and not your hands! Even powered down snowblowers can cause serious injuries. 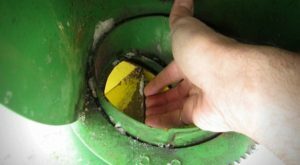 Injuries from powered down snow blowers are very serious and happen to older experienced operators. The culprit appears to be wet snow. It clogs the augers and the impeller. When you shut the engine off rotational force is still in place because of the wet snow. If you try to remove the snow with your hand and fingers there is a high probability that you will lose your fingers. When the clogged wet snow is removed the impeller will move and slice off your fingers. At first you may not even realize that they are gone. Never stick your hand and fingers anywhere near the auger or the impeller! The best way to remove that heavy wet snow from a clogged snow blower is to use a stick or the tool that it came with. It may be frustrating and take more time but it is so much better than losing a finger. The snow is wet and heavy. Clear it out immediately before it has a chance to freeze. If it does freeze you will not be able to unclog it until spring. Injuries from powered down snow blowers are increasing every year. We have not included any pictures in our posts of the injuries, however there are lots on the internet and some of them are pretty gruesome. There are no safety warnings in the manual or on the machine. Never stick your hands anywhere near the auger or the impeller ever! Many people lose their fingers or worse, their hands in snowblower accidents every year. Most people put their fingers or hands were they shouldn’t. They get sliced by the auger or by the impeller. Snowblower manufacturers advise all operators to shut the snowblower off, before dislodging any compacted snow that is impeding the snowblower. This is a pretty standard safety recommendation. Don’t put your hands or your arm anywhere near the auger or the impeller on a two-stage snowblower. But consumers are still getting injured from snowblowers when the engine has been turned off. They are losing fingers and damaging their hands drastically in many cases. A recent study undertook to find out why this was happening and it comes down to a build up of rotational force! When wet snow gets stuck in a snowblower and plugs the machine you need to shut the engine off to clear the snow. Most people know that they should use a stick or a special tool provided by the snowblower manufacture. Use the tool clear the snow from the auger and also from the impeller. But sometimes that just does not work. It is wet snow and difficult to remove from that area of the snowblower. In frustration they reach in with their hands to clear the snow. Particularly from around the impeller as the picture shows above. Since the snow is compacted inside the machine, there is a build up of rotational force. When the snow is removed by a stick or by hand the impeller will rotate sometimes buy as much as several inches. This is enough to slice off a finger or even a hand. At the very least there is going to be significant damage to your limb. 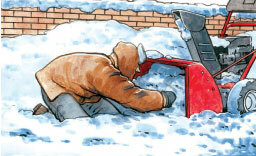 There are no warnings in most snowblower manuals or on the machine of this problem. The bottom line, is never stick your finger or hand anywhere near the impeller or the augers when the snow blower is plugged by snow. Wet snow appears to be the most significant problem. Always use a stick and be patient and work at it until the snow was removed. Better to have the stick get cut in half than your fingers. There are lots of serious snowblower accidents every year. In some cases operators lose a hand, fingers or even a foot. 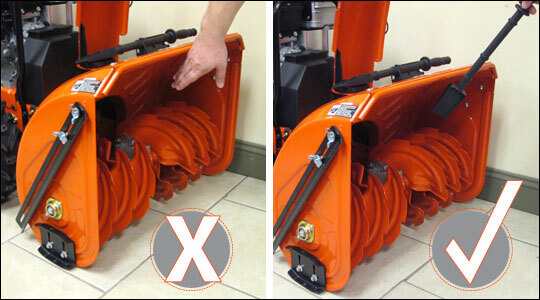 Many snowblower foot accidents usually occur when the snowblower jams and operators attempt to clear the snow away while the engine is still running. Never stick your hand in the auger area or your foot. You’re taking a serious risk of being injured. These residential consumer snowblowers are quite powerful and capable of cutting through the hand or foot. Always take proper safety precautions before clearing snow from a jammed snowblower. If the snowblower jams, turn it off before attempting any work to clear the jam. Wait 10 seconds to make sure that the auger and the impeller have stopped rotating. Always use a snow clearing tool to clear snow from the auger or the impeller. Never use your hands or feet to attempt to remove the snow. Do not remove any shields or safety equipment from the snowblower. Keep your hands and feet away from all moving parts. Wear tight fitting clothing and remove scarfs that may droop down into moving parts. Avoid distractions, keep a clear head and concentrate on what you’re doing. This is a good time to remind everyone about being extra careful around snow blowers this season. Many people each year will lose a hand , fingers or experience severe damage to their arms as a result of an accident with a snow blower. How does this happen you might ask. Even though we mention on every post that you should always turn off the snow blower before attempting to do any work on the machine, there is one other safety measure you need to take. All Snow Blowers are powerful machines and should be treated with safety in mind. Carefully read all of the safety guidelines in the manual prior to operating the machine for the first time. Follow these guidelines to ensure that both you and the machine do not have an accident. 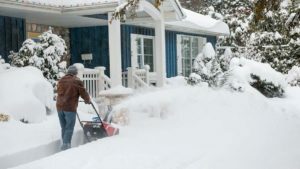 Prior to starting your snow blower the first time each day, perform a quick walk around check of the machine to ensure there are no loose parts and no leaking fluids. Check the engine oil to ensure that it is at the correct level as specified by the manual. Top up if necessary. Fill the fuel tank while the engine is cold and prior to using the machine. If you do spill fuel, wait until it has fully evaporated prior to starting the engine. Never spill fuel on a hot engine to avoid fires. Always fill the fuel tank outdoors to avoid any possibility of vapors going into your house.